Biography and Paintings of Fauvist Landscape Artist. Best known as one of the Fauvist painters, and a close friend and colleague of Henri Matisse, Albert Marquet produced some of the most well-designed, harmonious, even poetic works of Post-Impressionism, during the early decades of the 20th century. He specialized in small-scale landscape painting in oils and watercolours, featuring scenes of waterways and ports, but also produced some outstanding figurative works. Despite his international reputation as an important member of the Ecole de Paris, and a key figure in modern French painting, Marquet remained a quiet, timid individual and turned down all offers of honours in later life. Born in Bordeaux, Marquet came to Paris in 1890 and began studying at the School of Arts and Crafts (Ecole des Arts Decoratifs) where, in 1892, he made friends with Henri Matisse, a friendship which lasted until his death. In 1895 he transferred to the Ecole des Beaux Arts where he came under the influence of Professor Gustave Moreau - a symbolist artist and follower of the Romantic tradition of Delacroix and Chasseriau, as well as an important influence on modern artists like Matisse and Georges Rouault (1871-1958). In 1898 he joined Moreau's studio alongside Matisse, Rouault, Charles Camoin (1879-1965) and Henri-Charles Manguin (1874-1949). A close lifelong friend of Matisse, with whom he discussed his work with the greatest frankness, Marquet also turned to pure colour under the influence of Neo-Impressionism. However, his painting, with its light/dark contrasts, remained more strongly dependent on tradition. In early 1898-9 he visited the Academie Carriere with Matisse and painted street scenes with Camoin. In 1900, he and Matisse collaborated on decorative friezes in the Grand Palais. In 1905, Marquet, along with Matisse, Rouault, Manguin, Maurice de Vlaminck (1876-1958), Andre Derain (1880-1954), Othon Friesz (1879-1949), Raoul Dufy (1877-1953), Georges Braque (1882-1963), Jean Puy (1876-1960), Louis Valtat and Georges Dufrenoy, exhibited at the sensational "Fauvism" show at the Salon d'Automne - so-called after the art critic Louis Vauxcelles (1870-1943) commented that the exhibits were painted by "Fauves" (wild beasts). In 1907 the Druet Gallery gave Marquet his first one-man exhibition. 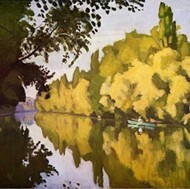 Also, from 1907 onwards, he produced a large number of city views of Paris, particularly its waterways. It was already evident that Marquet was first and foremost a landscape painter who was mainly attracted by landscapes near water - like the Paris quais, beaches and ports. His preferred method was to select sections of landscape always viewed from above and with a wide perspective; depth was emphasized by diagonal lines. The drawing was sketchy, simplified, but precise. Even though Marquet used brilliant, strong colour pigments to start with, he often finished his paintings in grey. He moved from typical Fauvism to a simplified, calm Impressionism, to which he remained faithful for the rest of his life. As well as Impressionist landscape painting he also produced some excellent figurative painting, including several powerful female nudes (1910-14) and numerous portraits. One of the early 20th century masters of drawing, from 1925 onwards he became more attracted to watercolour painting. Marquet travelled whenever possible - to Normandy with Andre Derain (1904-6); to the South of France with Manguin and Cross (1906); to London with Friesz (1907); to Munich (1910) and Morocco (1913) with Matisse. These were only the first steps in a lifetime of travelling. Indeed from 1907 until his death, Marquet divided his time between his Paris, the European coast, and North Africa - notably Algeria and Tunisia. During his travels he was a constant painter of ports, ships and cities next to water, like Algiers, Naples and Venice, and a great student of light and its effects. Marquet died from cancer in Paris in June 1947, aged 71. He remains one of the leading twentieth century painters, whose art occupies a niche somewhere between Impressionism and Expressionism, with a dash of calligraphic minimalism. 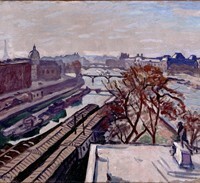 Expressionist paintings by Albert Marquet can be seen in many of the best art museums throughout the world.  For biographies of other Fauvist artists, see: Famous Painters.  For more details of expressionist painting, see: Homepage.